If your having problems with your UPVC door Lock then give Derek a ring at Locksmith St Helens on 07967 778940 who can give you an idea of what is wrong, and an idea of how much it would cost for Locksmith St Helens to fix it if you needed us to assist you. Lets look at the main components of your door and what can go wrong with them. The above photo shows a euro cylinder this is the part that you insert your key into in order to lock your door. Locksmith St Helens often find that some customers think that they have to replace the full door lock when their is only a problem with the euro cylinder. Locksmith St Helens suggest when you have a problem inserting the key check if another key works ok as sometimes a copy is not cut correctly and over time will not work or could damage your lock, if this does not work and you are still having problems inserting the key or the lock will only work from one side then Locksmith St Helens suggest changing your euro cylinder. 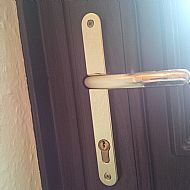 This is a upvc door handle their isnt that much that can go wrong with these however if your handles become loose then Locksmith St Helens suggest that you first check if the screws have come loose on the handle they can be seen top and bottom of this handle but may be underneath the handle and at the bottom. If this doesnt work then Locksmith St Helens suggest you check if the handle as broken near where it joins the door plate if this is ok and one of your handles is spinning around but the other works ok then Locksmith St Helens suggest that it is either that the handles have gone on the inside which connects with the spindle, or the spindle could have become disconnected from the handle. To check this out you would need to remove the handles from the door.